The DVL double-wall air insulated design reduces clearance to combustibles. DVL improves stove performance by maintaining high flue gas temperatures for a strong, steady draft. DVL is constructed with a stainless steel inner wall for long, lasting performance and safety. 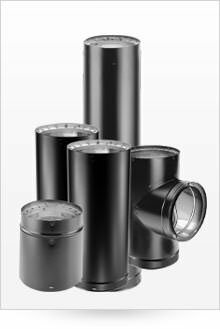 If you need close clearance stovepipe, Dura-Vent's DVL Double-Wall Black Stovepipe is the choice if you're using Dura/Plus Chimney, or DuraTech Chimney. In fact, it is recommended that you use the same manufacturer's double-wall stovepipe and factory-built chimney. This double-wall stovepipe has an inner wall of .012 (thinner than Ventis) 430-alloy stainless steel and an outer wall of .018 aluminized steel painted black (also thinner than Ventis' 24 gauge). DuraVent DVL double-wall black stovepipe allows you to reduce clearances from combustibles to the stovepipe from 18" down to 6" for wall and 8" to ceilings. When connecting to Dura-Vent's Dura/Plus Chimney or to DuraTech Chimney, a Close Clearance Adaptor is required for a proper connection. DVL Double-Wall Black Stovepipe is available in both 6" and 8" diameters. Outside diameter is 1" larger than inside diameter. Connecting pipe sections together is easy with predrilled holes and a pack of screws, included. All pipe pieces have a 1" overlap connection, reducing the actual pipe length by 1". Dura-Vent's DVL Double-Wall Black Stovepipe is warranted for 25 years ONLY if it is installed by a professional. * Hart's Hearth & Homestead installs and services woodstoves, stovepipe, and chimneys and our Top Choice is Ventis DoubleWall Stovepipe. 45 Degree Elbow; DuraVent DVL 7"
Tee with Cap; DuraVent DVL 7"
Stove Adapter; DuraVent DVL 7"
90 Degree Elbow; DuraVent DVL 7"